It is necessary in some cases to change the form for a record. In these cases, this is mostly to consolidate existing data or to adapt the form to match changes in the data structure. These functionalities are available under “Extras/Settings” in the ribbon. In the following screenshot, you can see the dialogue for “mapping” the form fields from the previously used form to the new form. In this example, a record that previously belonged to the “Website” form is being “mapped” to the “Password” form (right). The drop-down menu allows you to select the target form. The comparison of current and new form fields is shown in the lower section. The following options are required to change forms. !Please note that information could be lost during this process! In the example, this applies to the fields “Website” and “Information”. If you press the “Change form” button (as mentioned in the previous section), the already existing form will be used by default. 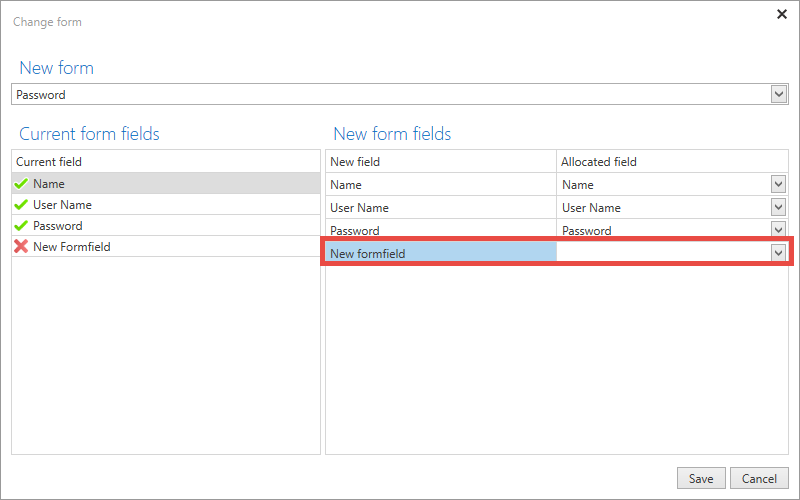 If this form has been changed in the meantime, the new form field will be directly shown and adopted after it is saved. The setting “Apply form changes to passwords” makes it possible to force the change to the form to be adopted. This becomes effective when editing the record! It is immaterial here whether changes are being made to the record. Simply re-editing and saving the record will cause the adjustment to the form. The “read”, “write” and “authorize” rights for the record (and the form to be edited) are required. A common feature of both variants is that adjustments to forms cannot be automatically triggered. Already existing records are thus not automatically adjusted. The adjustment thus needs to be carried out manually. In the first case, the manual step is to use the function “Change form”. In the second case, it is sufficient to simply edit and save the record.